Glenn Clark grew up in Bilgola Plateau on Sydney's northern beaches playing drums and alto sax in Bilgola Plateau Public School Band, swapping to tenor sax in Barrenjoey High School Bands. He was also an active member of community bands such as the "Blue Riff Big Band", "Swing Thing Big Band" and Ralph Pyl's "Peninsula Big Band" (aka the Groove Merchants). In 1994 he was employed by Dickson's Music Complex in Chatswood where he was trained in musical instrument sales and musical instrument repair. During this time he played tenor sax with popular cover band "Boogie Wonderland" which had a residency at the "Charlie Bar" in Manly and other venues around Sydney. 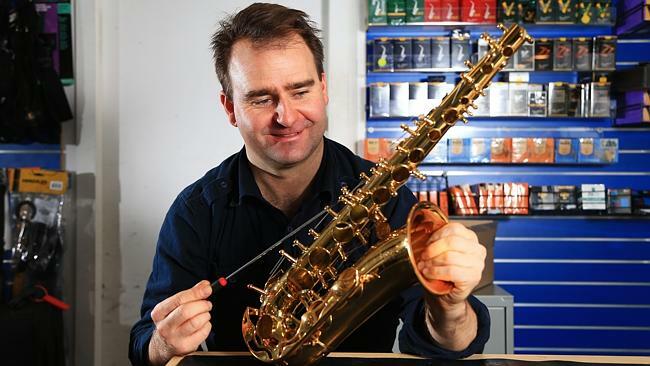 He became Head Repair Technician at Dicksons' Music from 1998 until 2003 when he founded In Tune Music in Crows Nest on Sydney's northshore to focus on brass and woodwind musical instruments, musical instrument repairs and accessories. Glenn continued to play with cover band "Busy Hands" and original rock bands "The Consorts" and "Albert the Good" releasing the album "Groove. Rock. Funk. Distortia" in 2008. In 2010, In Tune Music moved to larger retail and workshop premises in St Leonard's on Sydney's northshore. Over the past 11 years, In Tune Music has provided services to bands such as "The Eagles", the Royal Australian Navy and over one hundred school band programmes across Sydney and regional NSW. Brent Clark grew up in Bilgola Plateau on Sydney's northern beaches starting on the piano at age 5. He took up alto sax at age 10 and joined Bilgola Plateau Public School Band. He also auditioned for the Sydney Schools Symphony Orchestra playing orchestral percussion at the Sydney Opera House. At Barrenjoey High he played percussion in the concert band and alto saxophone in the Stage Band. He also played percussion in the Sydney Schools Symphonic Wind Ensemble under the direction of Stephen Williams, winning the National Senior A Grade Concert Band Championships in 1988. Brent experimented with jazz vibraphone in the "Blue Riff Big Band" and in 1990 he toured to Japan with the "City of Sydney Concert Band" performing at Tokyo Disneyland. While studying at Macquarie University he co-founded the "Swing Thing Big Band", the acid jazz group "Cold Fusion" and joined the "Peninsula Big Band" under the direction of Ralph Pyl. He also played with jazz quartet "the Combo" which had a residency at Collaroy Beach Services Club and the Newport Arms Hotel. Other bands he played with include Joan Thorp's "Abracadabra Big Band", the "Australian Tom Jones Experience" and the "Australian Blues Brothers Show". He also recorded for Northern Beaches original band "Gladys the Groovy Mule", was a member of "Carnival of Light" and was a music tutor for Dickson's Music. In 2006 he studied at the Australian Graduate School of Management and in 2013 he left his role as an executive at the Commonwealth Bank to join In Tune Music.